Now, more than ever, consumers crave authenticity. A whopping 90% of consumers say authenticity is important when deciding which brands they like and support — up from 86% in 2017. This is a sentiment that is not lost on marketers, with 83% saying authenticity is very important to their brands. So which type of content do consumers believe is most authentic? User-generated content is viewed as the most authentic form of content by consumers globally, with 58% of consumers agreeing. Meanwhile, marketers are on a different page. When asked what the most authentic form of content was, 43% of marketers diplomatically said all types of content can be ‘equally authentic’, followed by 32% of marketers who believe brand-created content is most authentic and a mere 15% who said consumer-created content was most authentic. 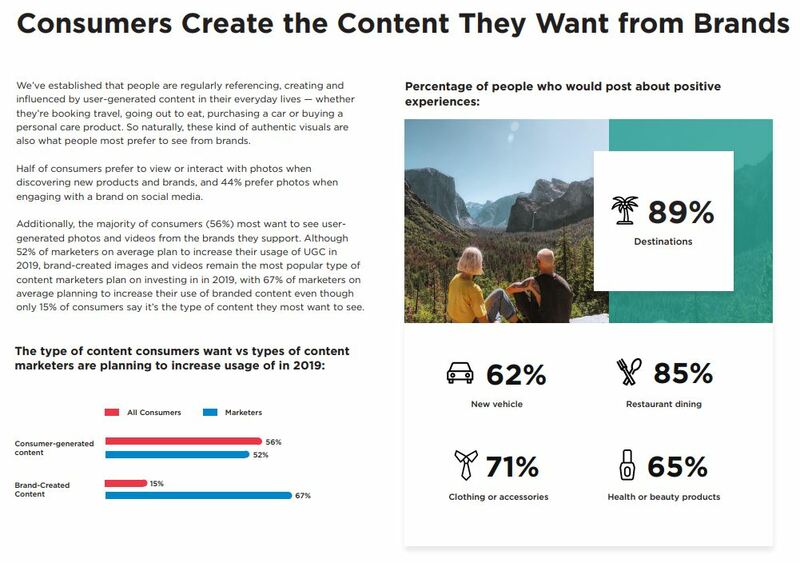 In other words, consumers are 2.4x more likely to say consumer-created content is most authentic compared to branded content and over 19x more likely to say it’s most authentic compared to stock photography. 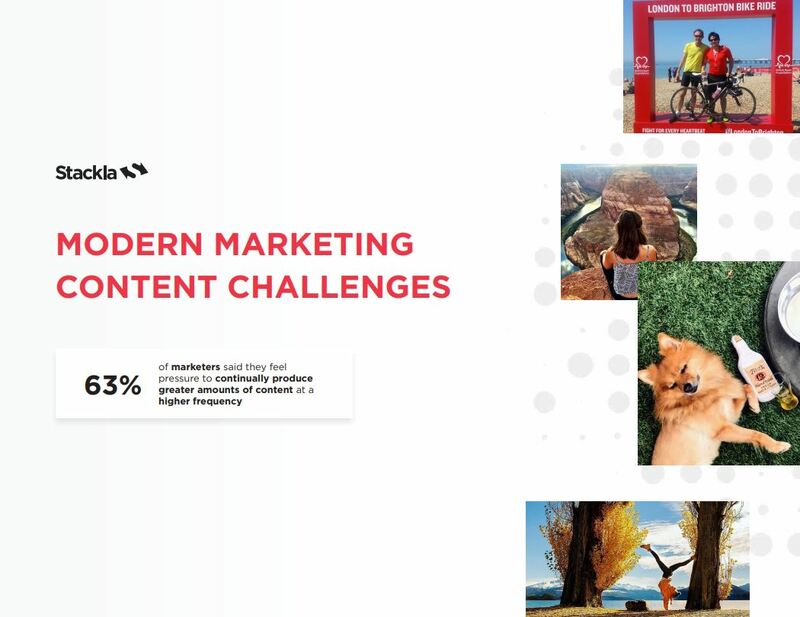 Conversely, marketers see brand-created content as 2.1x more authentic than consumer-generated content — a gap in perspective marketers will need to bridge in order to meet consumers’ demands for authentic content experiences. The disconnect between marketers and consumers’ views of content authenticity can help explain their diverging perspectives on brands’ ability to deliver content that resonates as authentic to audiences. Although brands have gotten slightly better at putting authentic content in front of their audiences, the majority of consumers (51% — down from 57% in 2017) still believe that less than half of brands create content that resonates as authentic. Yet, 92% of marketers believe most or all of the content their brand creates resonates as authentic with consumers, proving that while they’ve made incremental progress in recent years, marketers’ confidence in the authenticity of their content remains overly bullish. 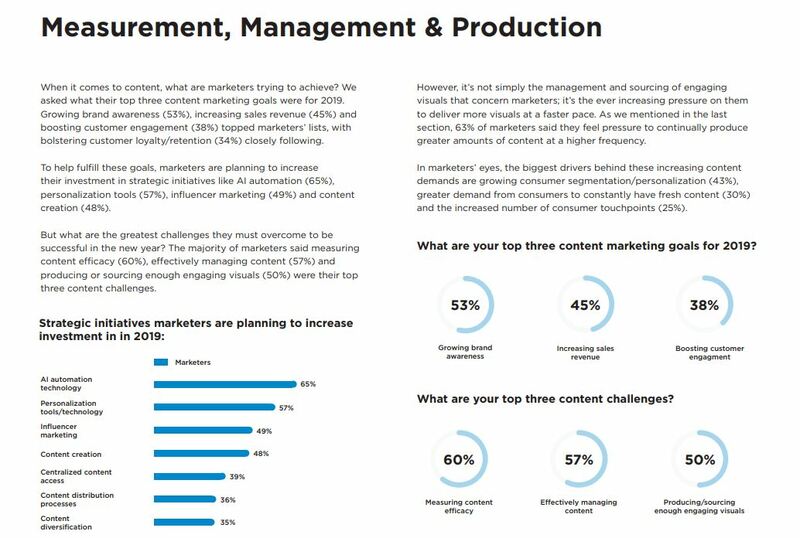 When asked what makes content marketing effective, 61% of marketers said authenticity, 51% said engaging and compelling visuals and 49% said relevance to audience. Herein lies a crucial issue for marketers: they believe authenticity is the most important component of effective content, yet the content they perceive to be the most authentic — brand-created content — is not the content the people they’re trying to reach view as the authentic. Consumers now have more ways than ever to discover, research and purchase products and services. 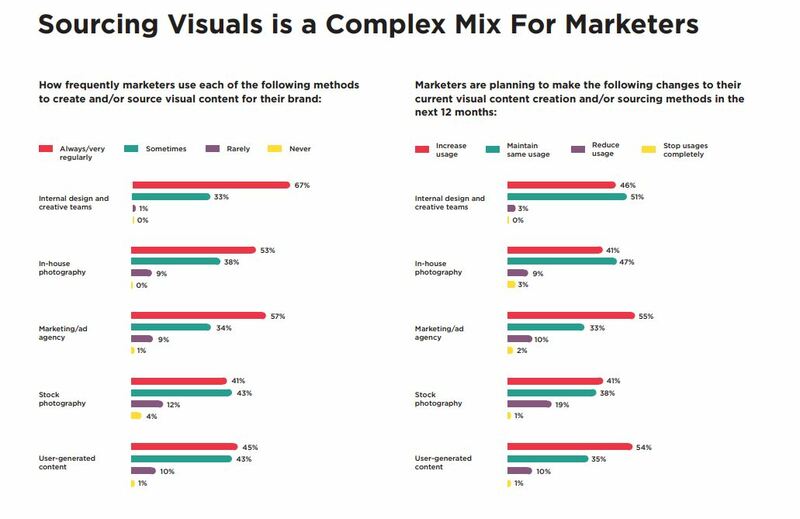 But of the thousands of visuals they encounter everyday, which are the most influential when it comes time to make a purchasing decision? 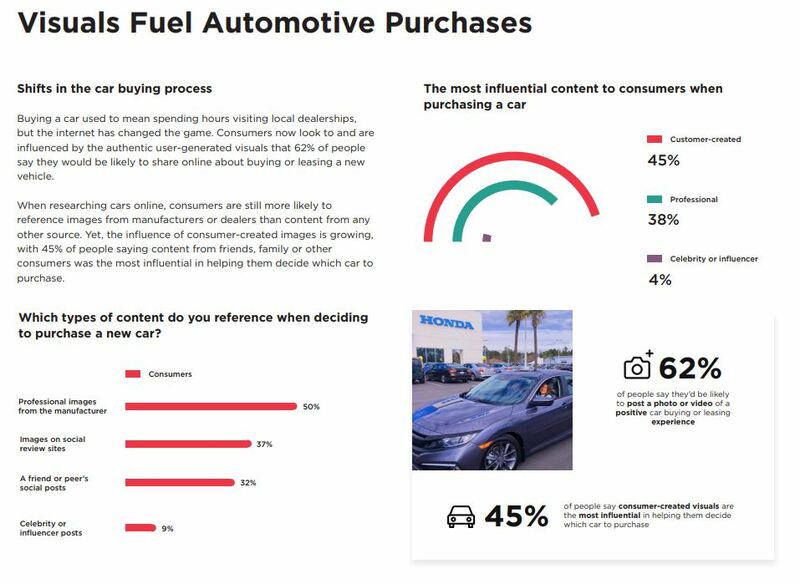 In 2017, we revealed that on average 60% of people said consumercreated content influences people’s purchasing decisions. This year, that trend has significantly grown, with 79% of people saying user-generated content highly impacts their purchasing decisions. Even more notable is the waning impact celebrities and social influencers have on people’s purchasing decisions, with only 8% saying influencer content highly impacts their purchases — down from 23% in 2017. This makes user-generated content 9.8x more influential than influencer content. 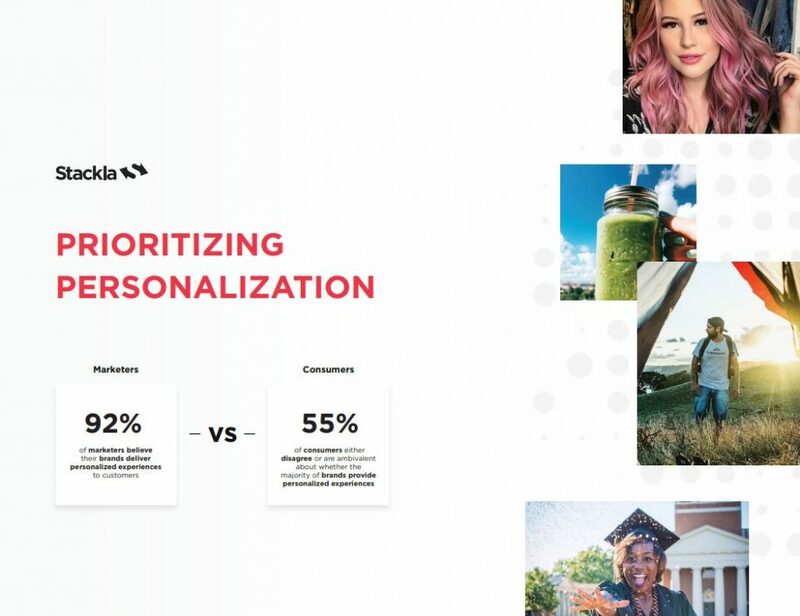 Once again, there is a glaring disconnect between the type of content that most impacts consumers — user-generated content — versus the type of content marketers believe is effective — brand-created content. 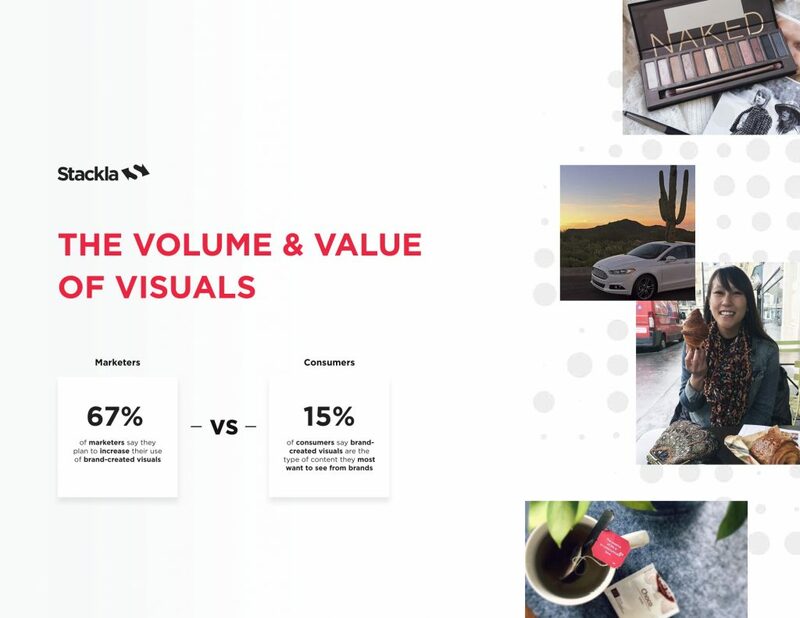 Although only 13% of consumers say that brand-created content influences their purchasing decisions, 61% of marketers believe their branded visuals are highly effective, with 38% saying they’re moderately effective and only 1% saying they’re slightly effective. Consumers increasingly look to social proof for travel inspiration & validation It’s hard to understate the impact social media has had on the travel industry. 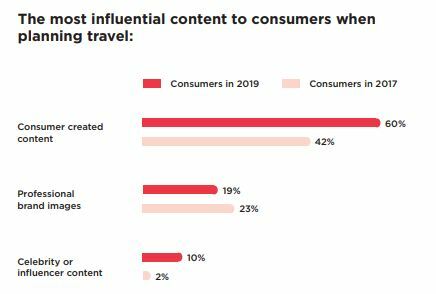 In our 2017 Consumer Content Report, we found that most people look to consumer-created content for travel inspiration and validation — a rising trend this year’s study digs deeper into throughout all the key stages of the travel booking cycle. 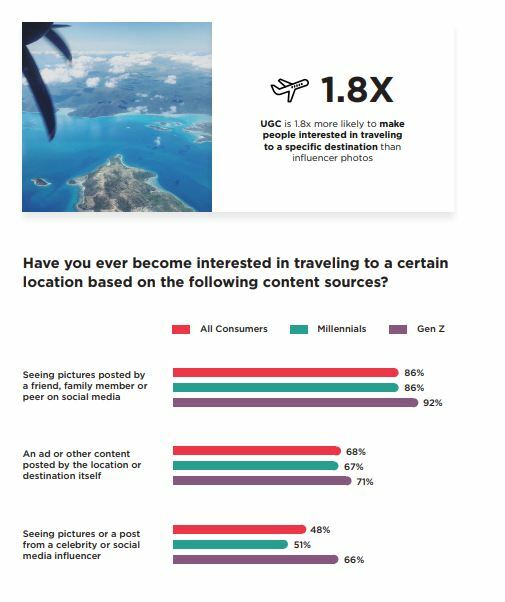 When we asked consumers which sources of content have sparked their interest in traveling to a particular destination, photos posted by friends, family or peers on social media were the top source of inspiration, with 86% of people (and 92% of Gen Z) saying they’ve become interested in a specific location based on that visual social proof. Noticeably, the type of social content matters; consumer-created photos are 1.8x more likely to interest people in travel than images from a celebrity or social influencer. What exactly are people looking for when they browse online travel, hospitality, and destination sites? 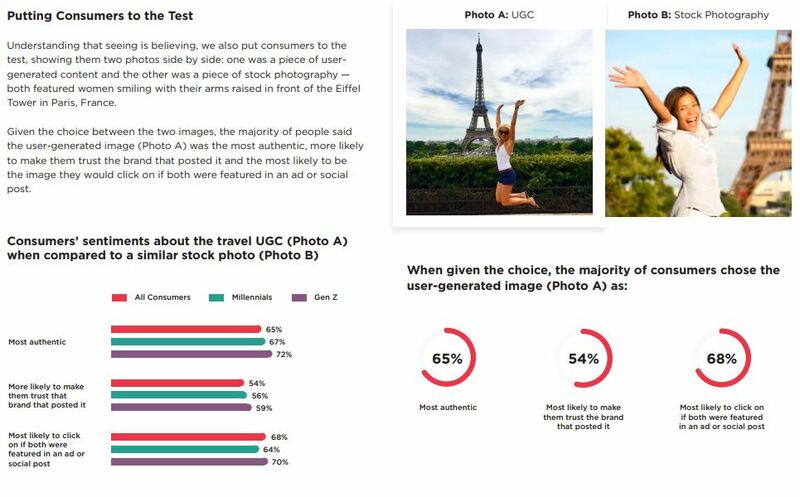 As it turns out, the majority are referencing user-generated visuals on social review sites (59%) and social networks (54%) as well as professional photos from hotels or resorts (55%). 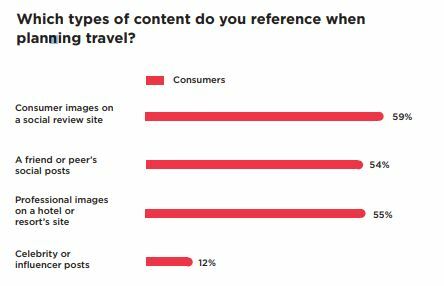 Yet, only 12% said they’d reference celebrity or influencer photos when planning travel. Since the ubiquitous accessibility of the internet has provided consumers with a wide variety of reference points to explore during the research phase of their travel planning process, we sought to understand which content sources are most influential. While the influence of UGC and professional branded images have improved since our last survey in 2017, the influence of celebrities and social influencers has declined. Sixty percent of people said content from friends, peers or other consumers were the most influential (up from 42% in 2017), 23% said professional images from travel brands’ websites (up 19% from 2017) and a mere 2% said influencer photos were the most influential (down from 10% in 2017). In fact, 38% of people went so far as to say content from celebrities or social media influencers never impacts which hotel or resort they choose to stay at when traveling. Consumer-generated images aren’t just theoretically influencing people’s travel decisions, they’re directly driving bookings — and in greater volumes than in the past. In fact, over half of consumers (52%) say they’ve made plans to visit a specific destination based on an image or video they saw from friends, family or peers on social media — up from 43% in 2017. Today’s consumers aren’t just inspired and influenced by user-generated travel content, they’re also active content creators who help perpetuate this virtuous cycle of inspiration and validation for others. When asked how likely they would be to post a photo or video of a positive experience in the follow scenarios, an overwhelming majority of people said they would post about a destination experience, a hotel or resort experience and a transportation experience. 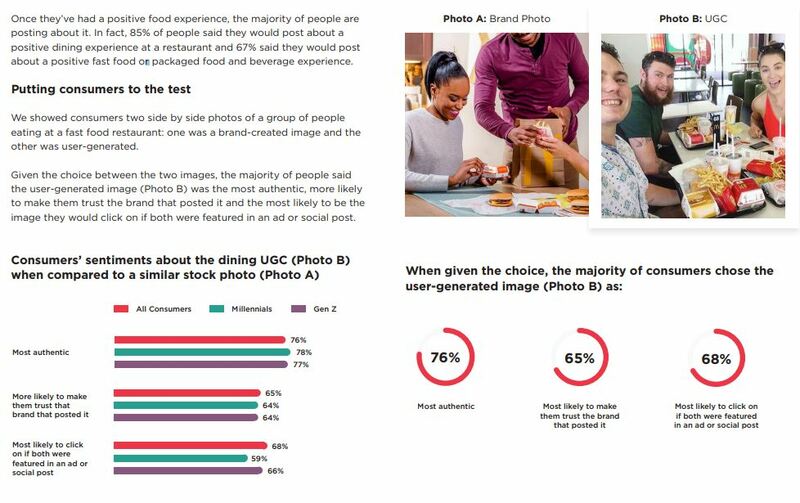 Feeding people the visual content they crave We asked what the main influencers were the last time people tried a new restaurant and the largest percentage of consumers (55%) said social photos from a friend or peer, with images from a social review site closely following (45%). When pressed for what was the most influential, 45% of people said content created by friends and peers were the most impactful when deciding which restaurant to dine at — up from 25% in 2017. 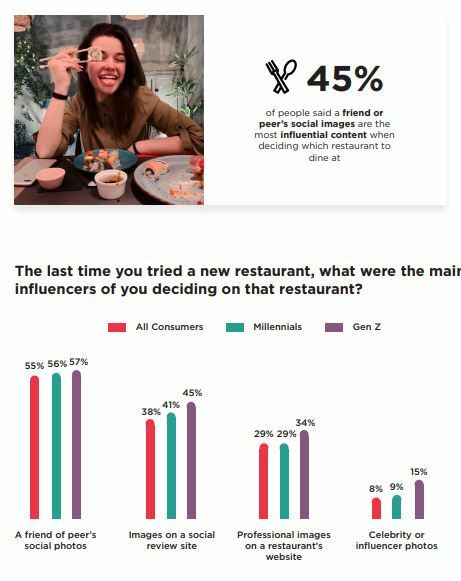 This trend was even more pronounced among younger consumers, with 49% of Gen Z consumers and 44% of Millennials saying consumer-generated content influences the restaurants they decide to dine at every time or most of the time. 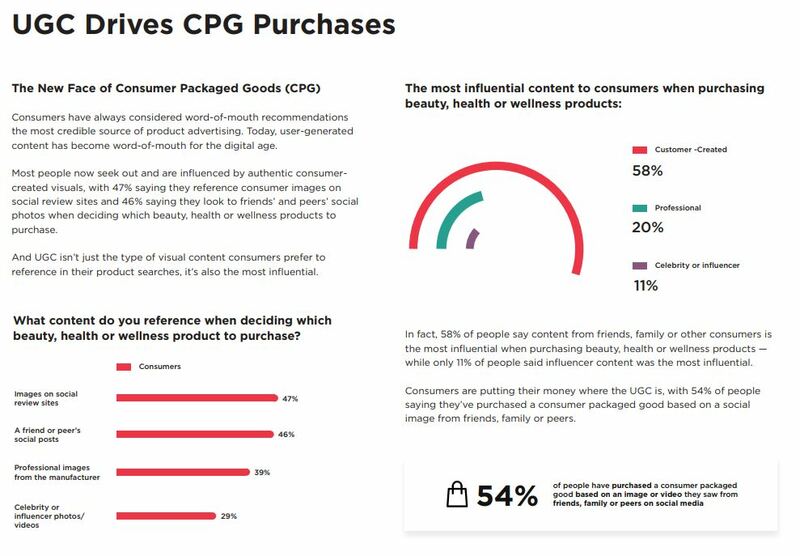 The influence of UGC even carries over to consumer packaged food products with 42% of Gen Z consumers and 36% of Millennials saying consumer-generated content influences the type of snack, food or beverage they buy every time or most of the time. And that’s not just talking, 57% of people have made plans to dine at a certain restaurant based on an image or video a friend, family member or peer posted on social media — up from 39% in 2017. To break through in today’s cluttered digital landscape, consumers and marketers agree authenticity, personalization and visuals are of great and growing importance. 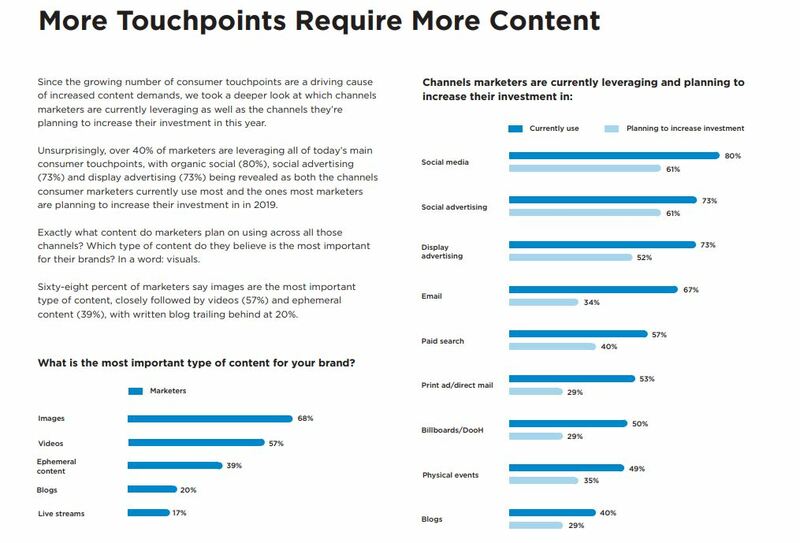 Yet, the significant disconnect this study has revealed between consumers’ and marketers’ views on which types of content are most sought after, authentic and influential should be a warning sign for B2C marketers across industries. Marketers believe authenticity is the most important component of effective content, yet the content they perceive to be most authentic — brand-created content — is not the content the people they’re trying to reach view as most genuine. 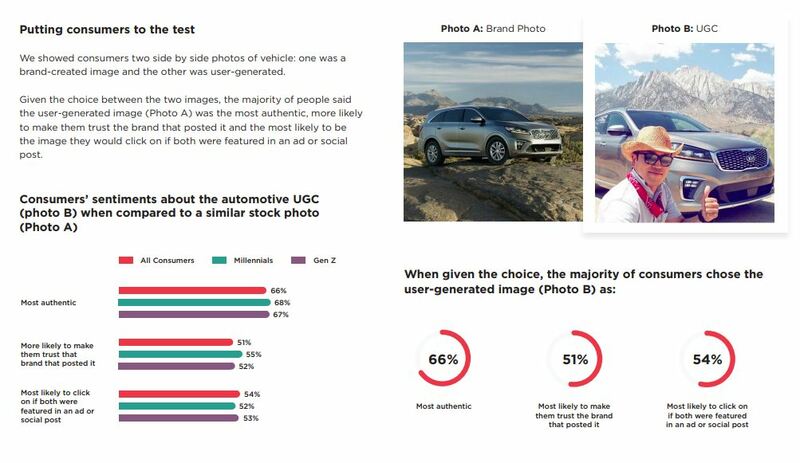 Consumers are 2.4x more likely to say usergenerated content is authentic compared to brand-created content, while marketers are 2.1x more likely to say brand-created content is authentic compared to UGC. 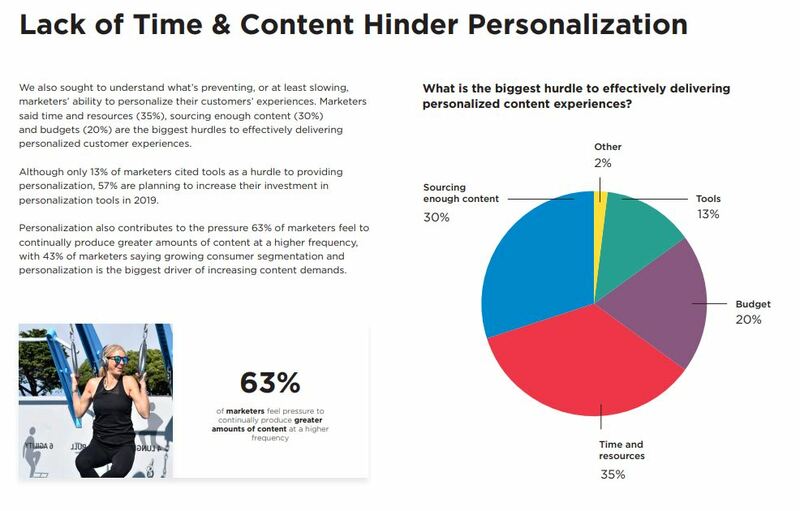 This false belief in the perceived authenticity of branded content explains the additional misconception marketers have that most or all of their brand content is effective when, in fact, 51% of consumers believe that less than half of brands create content that resonates as authentic and a mere 13% say brand-created content impacts their purchasing decisions. Building strategic plans off of these misperceptions, 67% of marketers will increase their use of branded content in 2019, even though only 15% of people say that’s the type of content they most want to see. Similarly, a very small (and decreasing) number of consumers say their purchasing decisions are impacted by influencer content. Still, nearly half of marketers plan to increase their investment in influencer marketing this year. 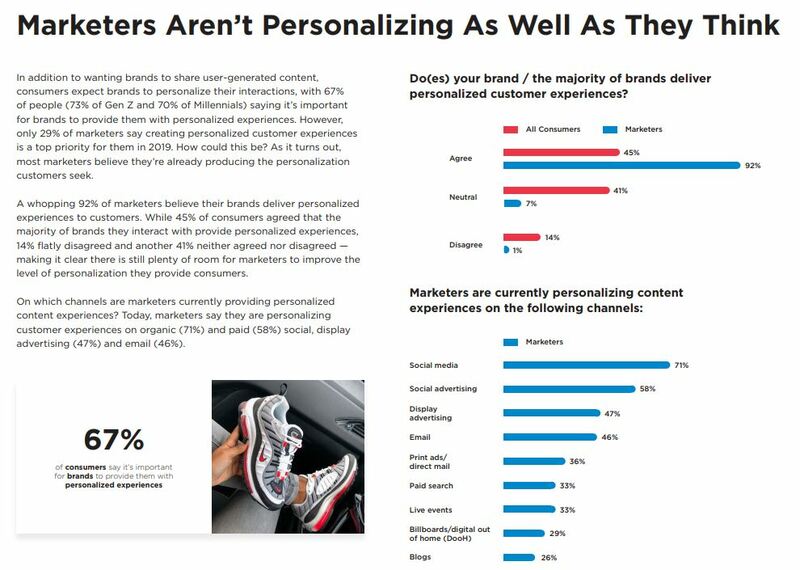 And marketers’ confidence in the level of personalization they’re providing consumers has also proven to be overstated, according to the people we surveyed. 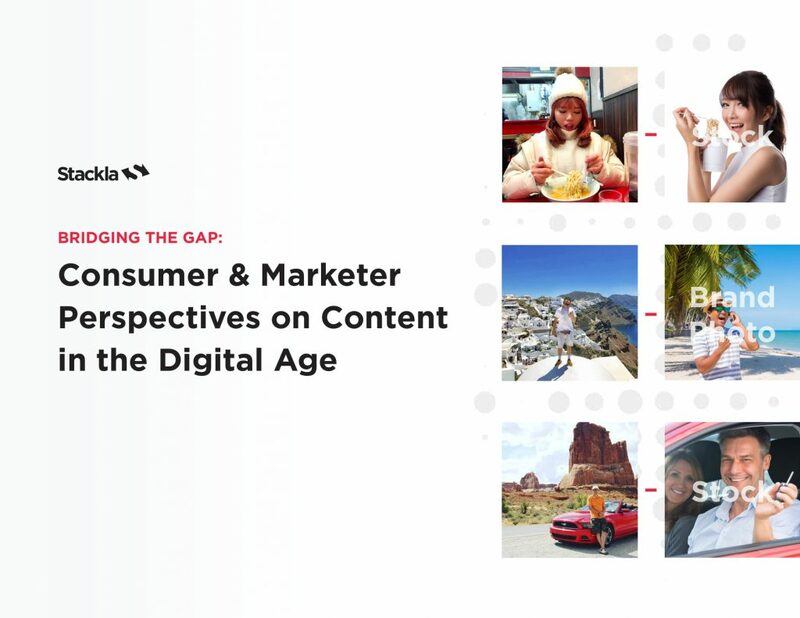 In order to bridge these glaring gaps in perception, marketers need to take note of what global consumers have repeatedly declared throughout this report: all content is not created equal. The authenticity and influence of user-generated content is unmatched, and UGC visuals are the most craved and created by consumers. 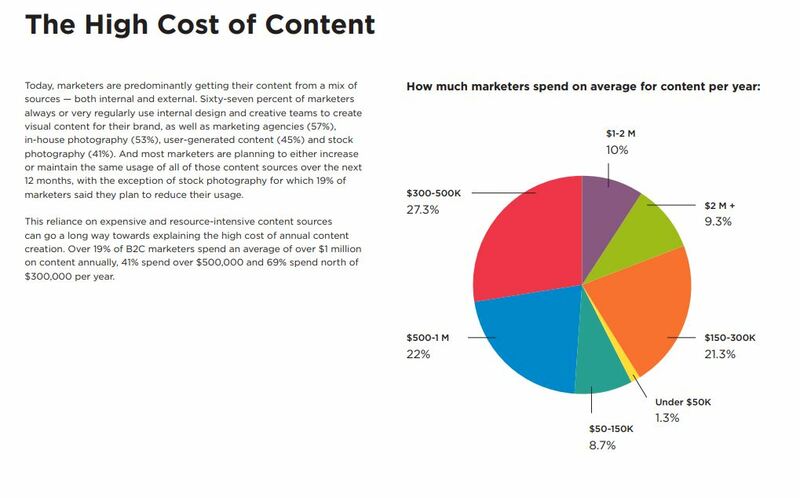 Not only would it benefit marketers to prioritize their use of the consumer-created visuals people seek, but the sheer abundance of these freely available visuals have the immense potential to lower the high costs most brands currently pay for content while also solving one of their greatest content and personalization challenges: producing enough engaging visuals at a fast enough frequency. With the overwhelming majority of consumers now seeking, trusting, posting and acting on consumer-created content, it’s clear brands can no longer simply rely on staged, stock and influencer images to break through the noise and establish meaningful connections with today’s consumers who increasingly crave authentic and personalization.